The Central Planning Gambit: Can Central Banks Avoid a Crash? The Bank for International Settlements put out its annual report on June 29. It says that the recovery is driven primarily by new fiat money generated by central banks. As a result, the pricing of capital assets is badly distorted. The overall theme is Austrian, not Keynesian. The global economy has shown encouraging signs over the past year but it has not shaken off its post-crisis malaise. Despite an aggressive and broad-based search for yield, with volatility and credit spreads sinking towards historical lows, and unusually accommodative monetary conditions, investment remains weak. Debt, both private and public, continues to rise while productivity growth has extended further its long-term downward trend. There is even talk of secular stagnation. Some banks have rebuilt capital and adjusted their business models, while others have more work to do. To return to sustainable and balanced growth, policies need to go beyond their traditional focus on the business cycle and take a longer-term perspective — one in which the financial cycle takes centre stage. They need to address head-on the structural deficiencies and resource misallocations masked by strong financial booms and revealed only in the subsequent busts. The only source of lasting prosperity is a stronger supply side. It is essential to move away from debt as the main engine of growth. Nearly six years after the apex of the financial crisis, the financial sector is still coping with its aftermath. Financial firms find themselves at a crossroads. Shifting attitudes towards risk in the choice of business models will influence the sector’s future profile. The speed of adjustment will be key to the financial sector again becoming a facilitator of economic growth. The banking sector has made progress in healing its wounds, but balance sheet repair is incomplete. Even though the sector has strengthened its aggregate capital position with retained earnings, progress has not been uniform. Sustainable profitability will thus be critical to completing the job. Accordingly, many banks have adopted more conservative business models promising greater earnings stability and have partly withdrawn from capital market activities. Looking forward, high indebtedness is the main source of banks’ vulnerability. Banks that have failed to adjust post-crisis face lingering balance sheet weaknesses from direct exposure to overindebted borrowers and the drag of debt overhang on economic recovery (Chapters III and IV). The situation is most acute in Europe, but banks there have stepped up efforts in the past year. Banks in economies less affected by the crisis but at a late financial boom phase must prepare for a slowdown and for dealing with higher non-performing assets. Then it discusses commercial banks — they are relying on the low interest rate environment to keep submarginal borrowers afloat. This is postponing inevitable losses. In the United States, non-performing loans tell a different story. After 2009, the country’s banking sector posted steady declines in theaggregate NPL ratio, which fell below 4% at end-2013. Coupled with robust asset growth, this suggests that the sector has madesubstantial progress in putting the crisis behind it. Persistent strains on mortgage borrowers, however, kept the NPL ratios of the two largest government-sponsored enterprises above 7% in 2013.Enforcing balance sheet repair is an important policy challenge in the euro area. The challenge has been complicated by a prolonged period of ultra-low interest rates. To the extent that low rates support wide interest margins, they provide useful respite for poorly performing banks. However, low rates also reduce the cost of – and thus encourage – forbearance, ie keeping effectively insolvent borrowers afloat in order to postpone the recognition of losses. The experience of Japan in the 1990s showed that protracted forbearance not only destabilises the banking sector directly but also acts as a drag on the supply of credit and leads to its misallocation (Chapter III). This underscores the value of the ECB’s asset quality review, which aims to expedite balance sheet repair, thus forming the basis of credible stress tests. The holy grail of central banking is this: shrink asset bubbles without crashing the economy. 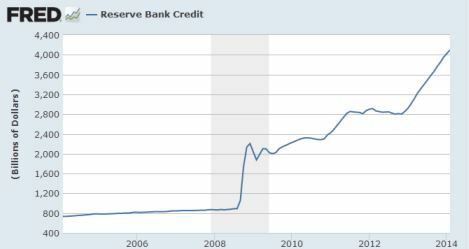 No central bank has ever accomplished this. Yet monetary central planners have big egos — they think they are the smartest people in the entire universe. Right now, they think they have the economy under their control — unemployment slowly falling, economic activity slowly improving, and consumer price inflation is nowhere in sight. Business cycle “recovery” phases (even weak ones) can’t last forever. The question is, can they pull off their ultimate gambit? If central banks can unwind the massive increases to their balance sheets without causing recessions, it will show that Keynesian economics works. It will be nothing short of a miracle. 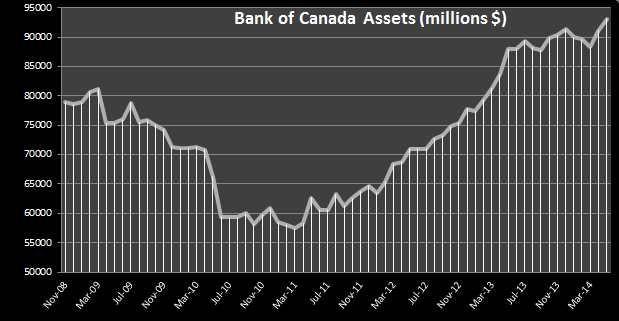 The Bank of Canada’s balance sheet is now bigger than ever. The central bank grows fat on the debts created by Ottawa. The rate of growth had slowed a bit in recent months, but the latest data tells us that Governor Poloz really doesn’t know what to do other than create new money and buy stuff. This is exasperating the business cycle and driving down the price of the Canadian dollar. The Bank of Canada’s assets are 99% Canadian government bills and bonds. Buying more of these bids up their prices and pushes interest rates lower than they would be otherwise. The newly created money enters the capital markets, and begins distorting the market’s allocation of resources. This is the cause of business cycles. Interestingly, rates are so low in Canada that capital is nearly free, but the Eastern economy is still a mess. According to Keynesianism, the entire country should be on the verge of Utopia. The aggressive monetary policy was kicked off by Carney, shortly after selling off the Bank’s emergency acquisitions of the financial crisis. Poloz is continuing this policy. He is trying to juice the Canadian economy by driving down the value of the Canadian dollar, thereby increasing exports, as he told us in his April 16 rate decision. This kind of short-sighted and special-interest-serving policy is to be expected from central bankers, particularly ones who worked Export Development Canada for more than a decade, like Poloz. Hilariously, a few days ago the mainstream media churned out a puff piece about how Poloz is the “king” of central bankers and other central bankers want to be like him. The article presents Poloz as a really cool dude because when he says something, the Canadian dollar’s value is more greatly affected than the value of other currencies when their central bankers talk. It never seems to occur to anyone that this is a horrible, horrible thing. It shows that the dollar is dangerously sensitive to the whims of central bankers, and that is not healthy for an economy. Uncertainty due to regulatory hazard is destructive to economic opportunity. But of course, words are one thing, and the biggest impact on the economy emerges from the BoC’s actions — i.e. printing money. And as we can see, the Bank of Canada still going full steam ahead with that plan. The Bank of Canada has somewhat arrested the rate of growth on its balance sheet. The monetary base has reached a bit of a “plateau” for now, very close to all-time highs from December 2013 ($91.045 billion on the books as of April 30 2014). It seems Poloz is trying to follow along with the general “tapering” strategy of the Fed. In order to maintain the “boom” of this business cycle (as lame a boom as it might be), the balance sheet’s size must continue to trend higher. But the flattening of the curve means that the BoC’s purchases are slowing. This will tend to push down asset prices. Is the Taper a Big Lie? The much-talked-about taper could be nothing more than a big joke. Where is the statistical evidence of the taper? 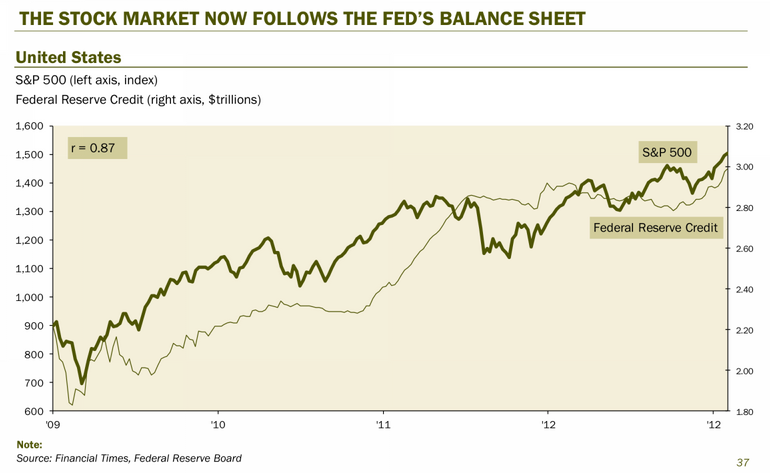 Let’s look at the last 10 years of the Federal Reserve’s balance sheet. Here you can see all three QEs laid out nicely. Let’s “zoom in” and look at just the last year. The rate of growth briefly slowed then picked right back up. Other purchases appear to be offsetting the taper, at least so far. On net, no taper. Watch what they do, don’t fret too much over what they say (central bankers lie all the time). Meanwhile, despite media reports and promises from European central bankers that they will inflate to prevent recession, the ECB is engaged in a deflationary policy, and has been for nearly a year. 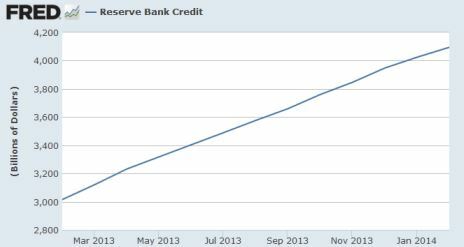 Sometimes the official central bank statistics don’t match their words. The Fed has been saying it will not let interest rates rise, yet at the same time it will slow its rate of purchasing assets. I don’t know how that is supposed to work, since regardless of the Federal Funds target rate, the market sets the real Federal Funds rate. Yet it almost makes sense if you assume while they might buy less crap via QE3, they will balance that with more purchases of different crap.